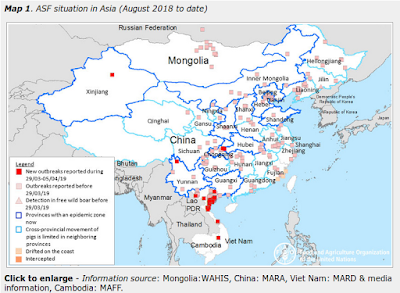 Up until a month ago, known H5N6 cases were widely scattered and sporadic in China, with only 4 cases reported across three provinces (Sichaun =1, Guangdong = 1, Yunnan=2) over a span of 19 months. 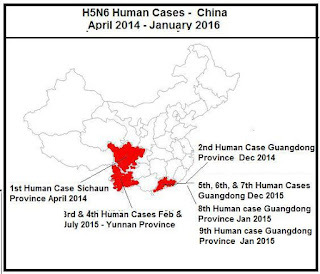 Between December 29th and mid-January we saw 4 additional cases emerge from Guangdong province, prompting state media sources to reassure on Friday that there was No Evidence Of H-2-H Transmission Of H5N6. Today we have a 5th notification, involving a 31 year old woman hospitalized in Futian, Shenzhen, published by neighboring Hong Kong's CHP. Given Guangdong Province's close proximity to, and trade relations with, Hong Kong - they tend to be more willing to share timely avian flu reports than do other Provinces. First the Hong Kong Notification, then I'll have a bit more. 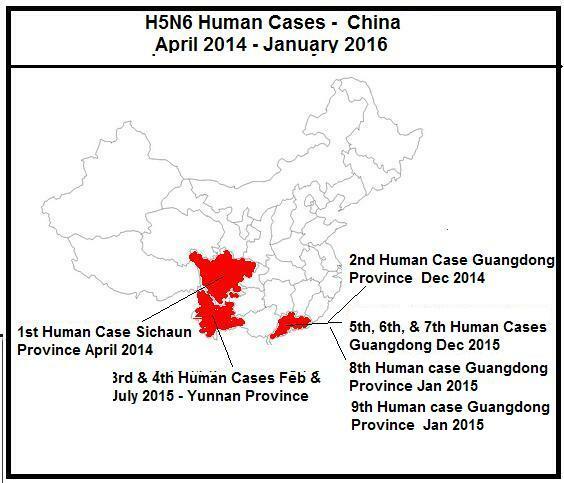 The Centre for Health Protection (CHP) of the Department of Health (DH) was notified of an additional human case of avian influenza A(H5N6) in Guangdong by the National Health and Family Planning Commission today (January 18), and again urged the public to maintain strict personal, food and environmental hygiene both locally and during travel. The case involves a woman aged 31 in Futian, Shenzhen. She developed fever and cough on January 8 and is currently hospitalised for treatment in critical condition. From 2014 to date, a total of nine human cases of avian influenza A(H5N6) have been reported by the Mainland health authorities. Although it has yet to have as big of impact as avian H7N9, the recently (2014) emerged H5N6 virus - a reassortant of H5N1 and H6N6 - has generated a good deal of concern as it has infected a small, but growing number of humans over the past 20 months. While details have been scant, we've seen nothing to suggest any of these five cases are epidemiologically related, or that the virus is circulating in the human population. Five cases in such a short period of time, however, does suggest the virus is getting better established in poultry populations and the environment. While H7N9 and H5N1 have been the most worrisome avian flu viruses to date, H5N6 is showing signs of becoming a contender, and is definitely a virus to watch.